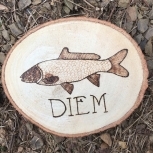 This cool nature themed sign would be a great addition to any room of you house. 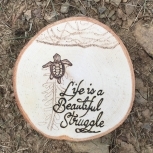 It is a simple and unique way to brighten your day when you look at this sign on your table or hanging from your wall. 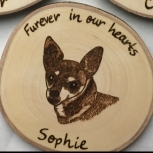 This medium sized basswood round measures approximately 7 nches in diameter and about 3/4 of an inch thick. 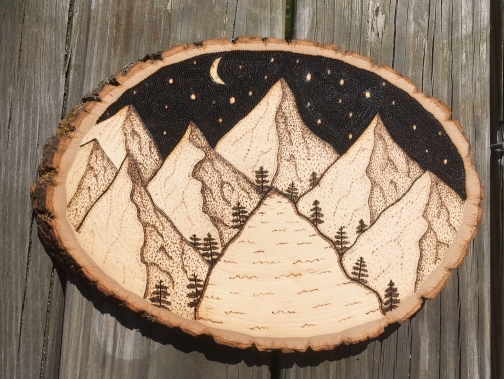 This listing has a handmade wood burned lake and mountain scene design with pine trees and a fully wood burned black background with stars and a crescent moon. 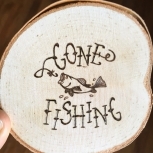 A cool gift for a friend or family member for any occasion especially those nature lovers and outdoorsy people. 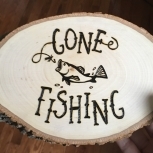 The sign comes with a saw tooth bracket on the back. No assembly required so you can hang your sign as soon as you get it. The sign also comes with a clear coat of polyurethane finish for protection of the wood and to give it a little shine. 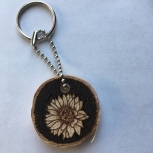 $4.50 USD ($1.00 USD when combined with another item) by USPS.